March 7, 2010. We had bits and pieces of this story in several places on the website, notably on Trina's page, Shaw 24 hull #1. A particularly interesting email (see below) on Feb 7, 2011 from Robert Rothbard (Delphinus) has motivated an effort to consolidate what we know about fiberglass hull Shaw 24s. Shaw 24 Hull #1, Trina, is pictured here. In an after hours project while working for Sparkman & Stephens, Bill Shaw designed Trina to the new MORC rule and later said of her " I did a half-size prototype of Finisterre, just to test the principles." She was built in 1957 by Jensen in Denmark - double planked mahogany and cedar over oak, a keel/centerboard with a yawl rig. According to Han van Diemen (Arlette) she was one of eight Shaw 24s built by Jensen, seven of which were exported to the US. 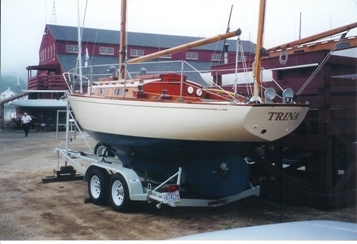 Trina was the first boat designed specifically to the Midget Ocean Racing Club (MORC) rule, initially a rule for off shore racing boats under 24' and later extended to boats under 30'. Following her launching in 1957 Trina reportedly won 17 consecutive races, racing under 4 different handicap rules, including MORC. She excelled in all weather especially in light air. Click here for a larger view and more pictures of Trina. Back to the matter of fiberglass hull Shaw 24s, your webmaster found an internal Rod Stephens memo from S&S files dated Feb 13, 1964 that will be of interest to the reader. It pertains to a conference attended by George O'Day, Lyman Bullerman, CEO of O'Day Corp, Bob Larson of US Yachts (the sales/marketer of the Dolphin 24) and Rod Stephens. The last part of this memo is excerpted below. The Gulf units were produced (bootlegged, seemingly) by an outfit that went broke - or worse. Rumor has it that 30 or 40 units were produced and sold. Bill Shaw has no facts and received no royalties. George and Bob agreed to see what they could find out and let us know. The Canadian competition is legitimate. The producer has limited production; perhaps 30-40 per year. These yachts will affect DOLPHIN sales in Canada. How much will depend on the workmanship and performance of the boats. However, this is legitimate competition and there is nothing to be done at this time. R.S." At this time we have no information regarding Canadian built boats. According to OJ Young, (Elva) these "Gulf" boats were produced in La Porte, Texas, near Galveston, by a group of 3 guys - Bob Marsh, John Wells and Chip Morse. John and Chip have passed away but your webmaster was able to speak to Bob Marsh. Production started with a fiberglass hull, later had a fiberglass deck. Bob reported that OJ Young, (Elva) had the first boat built in 1958/59. He did not know where the hull mold came from. He said a well known marine architect named John Wells in New York arranged for it, and presumably it came from a wooden Shaw 24 used as a plug. John Wells passed away in 1962. In the mid 1980's I had a chat with Bill Shaw. He was aware of the fiberglass boats and referred to my boat as a "pirate" because, he claimed, he received no compensation from her builders. According to the ad for Thumbelina she was reportedly built by Jensen in 1961 is which is 2-3 years later than the time frame that OJ Young reports that his boat was built.....We must always remind ourselves that these events happened half a century ago and memories are fallible. I ran across you web site and thought I should contact you. Around 1979-80 I found two fiberglass molds for a sailboat among other molds just sitting in some tall grass behind some buildings in Galveston, Texas. 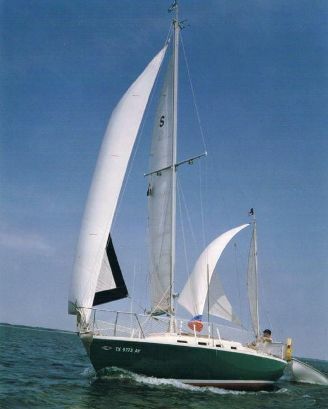 For a short time I worked at Island Yacht, a company that was building Peterson 34s. I worked in the mold shop and I laid up some hulls, decks, and interior parts for the 34s. I located the owner of the molds and he told me he cast a hull and deck from the two molds and would sell them to me. I purchased them and turned the molds into a boat. I didn't have the monies to purchase the fiberglass and/or resin. I ground down the molds and thru bolted and glassed the two molds together. Bolted on a cast iron keel that no one wanted. I purchased a used mast, yes, sorry only one, and launched "Delphinus". I only sailed her for a short time. There was a Shaw on Clear Lake, in Texas, but I never saw the owner. I donated Delphinus to the Sea Scouts and don't know whatever happened to the mold that became a boat. In the early 80' I hired a man who had a fiberglass fabrication shop, and it turns out that he was the guy who made the mold that I turned into a boat. At some point I may find a picture of the mold boat and send it to you. I presently have hull #36 Seapearl 21 that I have owned since new. I have her in storage and haven't sailed her for over a year, which is not a good thing.